THE GONDOLIERS - Page one. Designed and painted by Brian Willis. 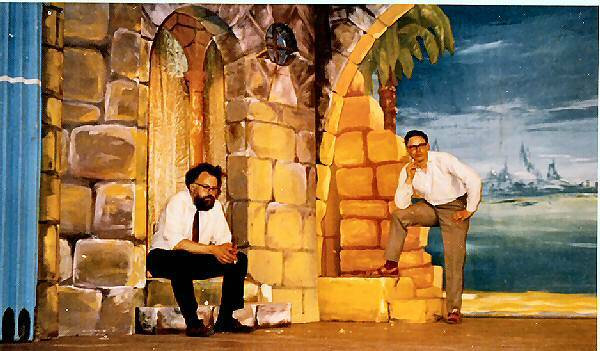 Set construction Colin Hompstead. Same set, Audience Right side this time. Put both pictures together and you almost have the full scene. 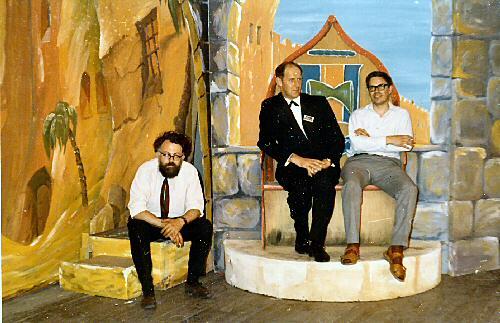 Me left (Brian Willis), J. Kroneman in dark suit who was the Bangor Stage Manager and Director who oversaw the different companies getting in and out of the theatre, And Colin Hompstead who built the sets. And yes that is a cigarette I am holding. Naughty naughty - especially on a stage. We are far more fire conscious nowadays and it just would not be tolerated even in amateur circles. However, it wouldn't worry me now as I gave them up about twenty years ago. This set was completely self supporting and needed no braces etc. Everything was supported either by bookflats, rostra or ramps. Only the backcloth needed to be hung from the theatre grid.